February 4, 2010 - It was nothing short of traumatic in the world of aviation. The global recession had a huge impact on the industry as both the leisure and corporate sectors seriously curtailed their flying. 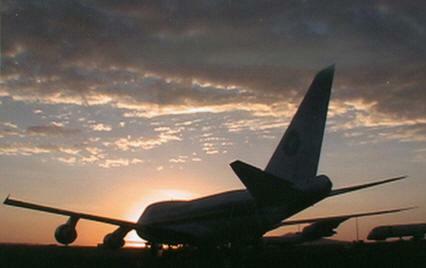 Freight too suffered a big decline and airlines were forced to cut capacity to meet the shrinking demand. Yields reduced too as airlines entered into price wars into order to entice the limited number of passengers onto their airline. But it was not only the airlines who suffered. The downturn was reflected in all areas of the aviation industry, both in Ireland and abroad, with job cuts taking place in many airlines, aircraft manufacturers, maintenance organization, etc. On the international airline front, many of the IAA's top ten customers were forced to cut jobs and cut capacity as revenues and profits plummeted. For example, British Airways is expecting its revenues for 2009 - 2010 to fall by £1 billion compared with the previous year. This amounts to the single largest loss in BA history according to their Chief Financial Officer. On the other side of the North Atlantic there are many examples of airlines struggling for survival. For example, Delta and Continental Airlines cut their winter capacity by 15 % and 5% respectively and both companies had layoffs. Mergers and takeovers were common in the airline industry during 2009. In 2009, the airline industry witnessed the biggest decline in air passenger traffic in the post-war era according to the International Air Transport Association (IATA). Passenger traffic had dropped by 3.5% when compared to 2008 while freight traffic fell 10%. North American carriers saw demand fall by 6% while European airlines suffered a 5% fall in demand. While there were some signs of a recovery in late 2009, the industry faces ‘enormous challenges' in 2010 according to IATA boss Giovanni Bisignani. He estimates that airlines collectively lost $11 billion last year and stand to lose a further $5.6 billion in 2010. Air navigation service providers (ANSPs) were not immune and they too experienced a significant reduction in traffic levels. In Europe in 2009, the total number of flights was 9.4 million, a decrease of 6.6% compared to 2008, and the largest annual decline on record. Traffic fell more severely in the first half of 2009 than in the second half while average daily traffic in Europe was around 25,800 flights a day, compared to 27,700 in 2008. 10% falls in traffic were experienced in the UK, Spain and the Netherlands. Ireland recorded an 8% and a 7.4% fall in its overflight traffic when compared to 2008 and 2007 respectively. The combined terminal traffic at Shannon, Dublin and Cork airports showed a 21% reduction in 2009 when compared to 2008 figures and a 20% reduction when compared to 2007 figures.